The recession has been a frightening time for restaurants. But it should not frighten them away from what they do best: giving their customers the most enjoyable dining experience possible. It's a truism of economics that downturns can be a time for businesses to capture additional market share while their competitors are in retreat. And adapting design and operations to changes in the marketplace is essential, as much for large chains as for independent restaurants. It can be dangerous to overreact to market trends that may fluctuate wildly. But there is one long-term trend that feeds all others: Humans inherently have a desire to be together. And when a restaurant design provides an uplifting social environment and a fresh look on life, it attracts guests… no matter where the economy is headed. Rather than investing in entirely new dining concepts, restaurants can help themselves quickly - and often cost-effectively - by updating their interiors. Design can also significantly improve the bottom line on the operational side, especially in regards to energy-use. Restaurants should consider, for example, the aerodynamics and velocity variables of their range hoods so as to reduce electricity costs and help create a more green environment. Many of the most successful new dining projects today are creating bottom-line efficiencies in their kitchens at the same time they are helping the planet achieve greater sustainability. The changes occurring at Buffets, Inc., provide a dramatic example. The nationwide restaurants - which includes Old Country Buffet, HomeTown Buffet, Country Buffet, Ryan's, Fire Mountain Grill and Tahoe Joe's - recently approached Cuningham Group Architecture, P.A. to design new cooking and serving concepts to attract younger, more health-conscious diners: the industry's future customers. The firm responded with interiors that encourage more social interaction than the traditional buffet-line layout. It also created new grilling stations for Buffets, Inc. that cut energy use up to 20%. The designs will debut at the Old Country Buffet in Colorado Springs, Colorado, in July 2009, and may eventually extend to numerous other restaurants within the Buffets, Inc. system. In the end, the design enhancements will improve Old Country Buffets' operating efficiency and revitalize its brand with one bold stroke. They penetrate to the core of the restaurants' business operations, providing a fresh, branded experience that attracts a new, larger audience. The aim is to reposition the restaurants for a healthy emergence from the recession, increasing its market share by appealing to Americans' desire for stimulating environments, affordable meals and healthy food choices. The Display Grill: This exhibition-style cooking station invites warmth and interactivity, elevating Buffets Inc.'s current Display-Grill popularity. After testing Cuningham Group's prototype grill, Buffets Inc. recognized its ability to increase business and may eventually install Display Grills in up to 300 restaurants nationwide. Buffets Inc. has taken exhibition cooking to a new level by removing barriers between the guest and chef while improving energy costs. The grill takes center stage in the serving area, making custom entrees easy to order. 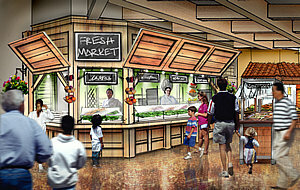 The Market Court: The Display Grill is part of a dramatically new, market-themed interior. Departing from a single buffet line, Cuningham Group created a "streetscape" of sorts, improving sightlines and adding serving areas separated into cultural cuisines as well as food groups. New categories include Bakery, Salad Bar and Greens, Italian, Mexican and the Display Grill, with each given its own place and identity. There are also rotating food stations to include Fusion, Asian and other cuisine. Freshness, Health and Friendliness: Within the Market Court, the interactive Display Grill and cultural cuisine advance buffet dining more completely toward healthy choices. The restaurant flow is now more social and organic than linear: It gives guests greater control over portions that are prepared right in front of them. It also heightens their awareness of food groups - such as carbohydrates, proteins and fruits and vegetables - allowing them to balance the savory with the healthy. The entire Market Court area is designed to make these decisions both easy and appetizing, with fresh produce, for example, displayed as it might be at a farmers market. Energy-Efficiency: Cuningham Group's reassessment of Buffet Inc.'s heating, ventilation and air-conditioning systems, controls and operations resulted in utility costs reduced 20 percent per restaurant in a controlled test. Buffets Inc. is studying how these improvements can extend to other restaurants in their system. Diverse Seating: Redesigned dining areas around the Market Court appeal to guests of all ages and energy levels, positioning the restaurants for years of added popularity. New groupings include exciting "street-side" seating, more intimate areas, group-size flexibility and private banquet opportunities. Generational Beverages: The Market Court divides beverages into children and adults stations, creating additional competitive advantages. Buffets Inc. used the greater accessibility to highlight its offerings, including frozen and chilled beverages and freshly brewed coffee. The Hood Icon: Stylized versions of the new Display Grill hoods will adorn the exteriors of all the updated restaurants, creating a symbol of vibrancy for Buffets Inc. This consolidation of rebranding, restaurant design and energy efficiency enhance brand awareness for the entire family of restaurants. Eventually, the Minneapolis-based architecture firm's enhancements will help Buffets, Inc. to create a cohesive national brand across the company's diverse collection of restaurants. These range in age and décor trends from 1985 to 2005 in all regions of the U.S. The approach taken with Buffets, Inc. by the architecture firm is consistent with that of all its restaurant clients, which include international locations including Egypt, Qatar, China, Spain, Korea as well as Las Vegas, Atlantic City, Los Angeles, Biloxi, Atlantic City, Minneapolis, and Downtown Disney Marketplace in Lake Buena Vista, Florida. As a design-driven company Cuningham Group embraces the dining experience as an opportunity to enhance the guest experience and help nurture and build a restaurant's business through design concepts that focus on environmental sustainability as much as they focus on brand identity. This approach includes closely monitoring all industry trends and finding solutions for restaurants in the vital connections between design, operations, service, location, demographics and brand identity. David Solner is Principal of Cuningham Group Architecture, P.A., which offers architecture, interior design, urban design and planning services for a diverse mix of client and project types. Founded in 1968, the firm is recognized as a leader in a variety of markets and has grown to over 200 employees in offices in Minneapolis, Los Angeles, Las Vegas, Biloxi, Bakersfield, Madrid and Seoul.